OPP130 Long Range RFID Tags utilize a wide -20°C to 80°C operating temperature range, and operate in the UHF band from 840 to 960MHz. 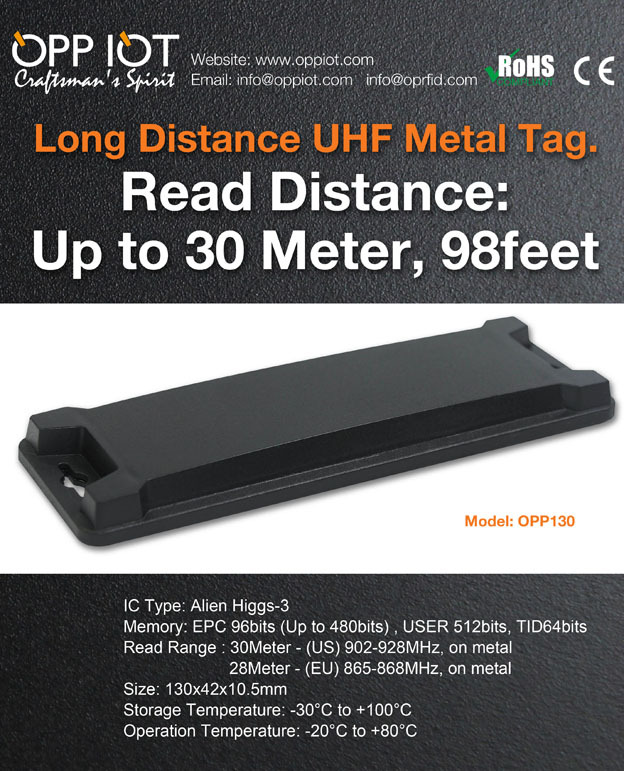 The OPP130 RFID tag incorporates a matched Alien Higgs-3 RFIC, and is IS0 18000-6C/EPC Class1 Gen2 compliant. A peel & stick easy installation makes these devices ideal for on-metal surfaces and reading distance up to 30 meters. * Asset tracking: vehicles, machinery, tools, steel containers, servers, etc. * Product inventory management: metallic assemblies, chassis, doors, equipment, etc. OPP IOT offers a wide range of RFID tags available in several designs and depending on the type of application. The company chooses and offers the type of TAGS that best fit the intended use, the application and tracking mode as well as the characteristics of the work environment, thus ensuring each Customer with the best price/performance for the specific context. Our company provides custom RFID Tag solutions that can suit very specific requirements, providing the best solution, in terms of detection as a result of contact with an extremely wide variety of materials.OPP IOT therefore offers RFID TAGS that are customised in shape, size and finish so as to ensure application to any product, even in the most adverse environmental conditions.